Michael Gesser, owner and master roaster of Alaska Coffee Roasting, has long been a fan of motor sports. Though, “fan” is probably an understatement. The only thing Michael is more passionate about than motor sports is coffee. Those of us in specialty coffee pride ourselves on our passion for the drink, from origin to cup, but most of us never discover an opportunity to tie in our other interests. Michael found one of those rare occasions to unite his passions. Even better, it benefited both. Michael raced cars as a kid and later traveled the world on the seat of a motorcycle, visiting coffee-producing countries in pursuit of high-quality beans. After opening Alaska Coffee Roasting, Michael got back on the racetrack at Sonoma Raceway in California, driving his Mazda formula car some days and his souped-up go-kart other days. On one of the trips, he raced with Pieter Rossi and struck up a friendship. “One day Pieter took me up the hill to see his young son, Alexander Rossi, racing his go-kart and it struck me, there and then, that Alexander would indeed become a world champion,” Michael says. Alexander is now twenty-two, and though he hasn’t been crowned world champion yet, he’s one of the best Formula 1 drivers his age. In 2008, he won the Formula BMW World Final, a top competition for young racers. He’s now a test driver for the Caterham F1 team and full-time racer for their minor league team. While Alexander was winning on the track, we were experiencing our own successes. Alaska Coffee Roasting opened in 1993 in Fairbanks, a town of about 30,000 people in the heart of the state. The business has grown every year. In 2011, Michael opened a sister store all the way in Miami, to be near his family and to have a good “launch point” for travel to Europe so he could follow Alexander. The original coffeehouse in Fairbanks, which had doubled its original size in 2002 and added a drive-through, was recently remodeled to add a second espresso machine and cash register to serve even more customers. While most of the growth has happened organically and advertising has been solely by word of mouth, the partnership with Team Rossi has certainly benefitted both parties significantly. Motor sports have one of the largest international followings of any sport, and having the Alaska Coffee Roasting logo whiz by in front of thousands upon thousands of spectators, both in the stands and watching on TV, is certainly advantageous. Alaska Coffee Roasting has seen increased web-sales and been introduced to the international market. This past racing season, the partnership with Team Rossi came to full flower. After years of Michael’s love of racing and coffee being linked only by sponsorship, the two finally shared the same space. The fresh scent of Alaska Coffee Roasting was able to mingle with the motor smells of the raceway. A La Marzocco Linea was installed in the Caterham F1 Team’s hospitality trailer in the Formula 1 paddock at Silverstone for the British Grand Prix. Michael sent me, his longtime Fairbanks store manager, to train the hospitality staff to use the machine along with our coffee. It was a major hit; people were coming to the hospitality trailer just for a coffee. 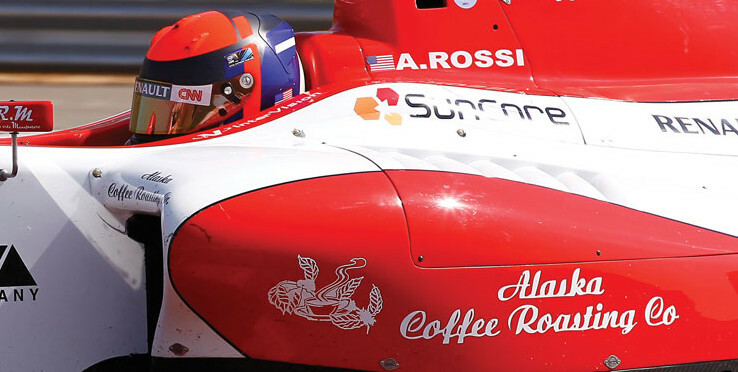 Featuring the coffee there in the paddock rather than just the logo on Alexander’s car and helmet was a conversation starter. Other sponsors, representing some of the elite brands in the world, were impressed with the quality of the coffee. Alaska Coffee Roasting now has many opportunities to explore in the food and beverage industry and even possibly in the airline industry. Last November Alexander was the first American driver in six years to drive Formula 1 in the US. It was a practice session, but in the highly regulated sport those sessions are almost exclusively for the two main drivers. It showed Caterham F1 wants the young racer to gain experience. We can expect great things from him in the coming years, and Alaska Coffee Roasting will be right there with him.